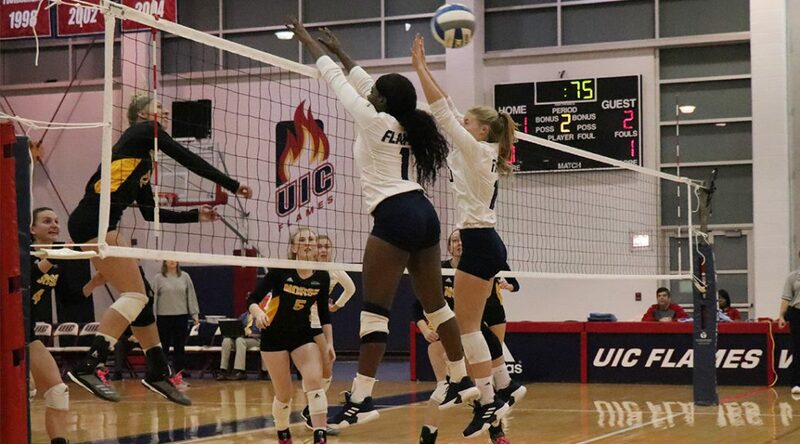 The UIC women’s volleyball team swept Milwaukee during their final match in the Flames Athletic Center Thursday. It took only three sets for the Flames to secure the win, with two UIC players finishing with double-digit kills. Milwaukee began the first set with the serve, but it wasn’t long before UIC libero Manuella Conte took the ball. During her first serving run of the match, she went on a five-point serving run from the help of teammates Kiera James and Ali Witt. James recorded three kills during Conte’s run, while Witt also registered three kills during the first eight points of the set. From there, the Flames and the Panthers exchanged points throughout the set, with UIC keeping a four-point lead. Not until Milwaukee’s Rylie Vaughn started serving did the Panthers bring themselves back into the set. With a four-point serving run and three kills from Kleja Cerniauskaite, the Panthers tie up the match at 17 points each. From there, the Flames were watching Milwaukee slowly pull away until outside hitter Paola Santiago contributed a kill for UIC. The Flames tied the game at 21 with Conte back at the service line. UIC continued to push Milwaukee during the remainder of the set. With the help of three kills from Witt and an overall hitting percentage of .778, the Flames closed out the first set of the match 25-23. During the second set, middle blocker Michelle Glover subbed into the match and made an immediate impact for the Flames. Coming off the first serve from UIC’s Emily Kelly, Glover found herself with two kills and a block during the first six points of the match. The Flames were up 5-1. UIC did not let up. They continued to keep at least a three-point lead throughout the match with the help of a strong service effort from the Flames and multiple errors from the Panthers. The closest Milwaukee got to taking over the second set was at 22-20 when the Flames still held the lead, but it didn’t last long for the Panthers. With two kills from Glover and an ace from defensive specialist Velina Minkova, UIC concluded the second set 25-20. At the start of the third set, the Panthers had the served up the first two points. Then Glover recorded another kill on the match, which resulted in service runs from both Conte and freshman Marija Borcic. Following those runs, the Flames would side out immediately after the Panthers’ serve, keeping a multiple-point lead throughout the entire match. By the end of the match, UIC kept the momentum. They finished the third set with a score of 25-13. With this win, the Flames swept the Panthers three sets to none, helping to keep them in fourth place in the Horizon League rankings. James led the match for the Flames with 13 kills, but Witt was right behind her. She finished the match with 12 kills, which is one less than her season high, and she also added five blocks. UIC played Green Bay on Saturday, losing to them two sets to three in Green Bay. The Flames will open up the Horizon League tournament this Friday against Milwaukee. Green Bay will host the tournament from Friday to Sunday, with the winner of the tournament getting an automatic bid into the NCAA volleyball tournament.